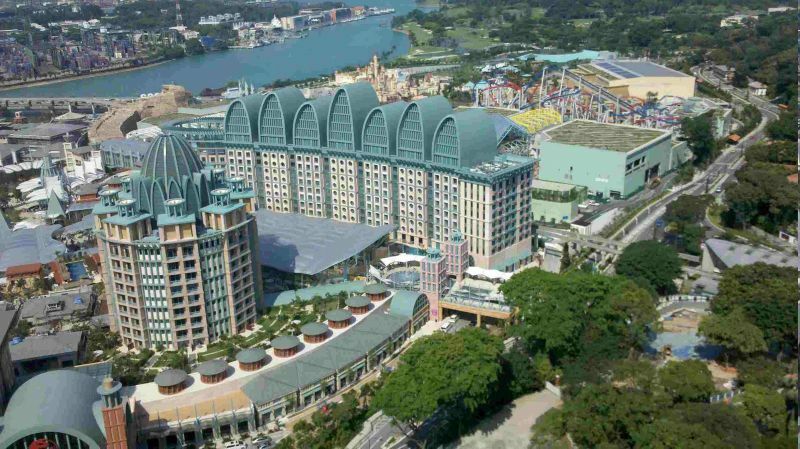 Resorts World Sentosa is an integrated resort on the island of Sentosa, off the southern coast of Singapore. The key attractions include one of Singapore's two casinos, a Universal Studios theme park and Marine Life Park, which includes the world's largest oceanarium. The S$6.59 billion (US$4.93 billion) resort is developed by Genting Singapore, listed on the SGX. It is one of the world's most expensive casino properties, after Marina Bay Sands. The resort occupies over 49 hectares (121 acres) of land and, when fully open, will employ more than 10,000 people directly. Resorts World Sentosa is a sister resort to Resorts World Genting, Pahang, Malaysia and Resorts World Manila, Philippines. The soft launch of the first four hotels took place on 20 January 2010, with the FestiveWalk shopping mall following on February 1. The casino opened on 14 February the first auspicious day of the Chinese New Year. The Maritime Experiential Museum will open on October 15, 2011. The Marine Life Park will open in 2012. Resorts World Sentosa is also expected to hold large-scale exhibitions such as Valentino, Retrospective: Past/Present/Future. Want to Win the Ultimate Transformers Experience?